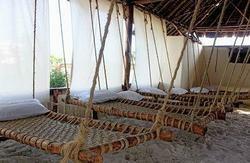 THE BEACH AFRICA is Africa, we offer student friendly prices in accommodation, drinks and meals. The Beach is surrounded by a local fisherman\'s village and serves fresh meals daily which includes a vegetarien menu, all is prepared the local way on a traditional firewood grill , which gives the famous taste of the area. Reggae flava fills the air and the ocean surrounds guests as they relax while enjoying natures gifts. 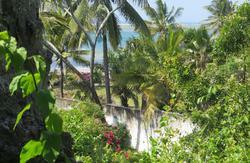 The Beach Africa is located in Mtwapa,, which is Kenya\'s Party Location No. 1, just 5 min away from a wild day and nightlife. the Beach Africa is the place for the young and young hearted, to have fun 24/7. Why stay anywhere else.. The bandas are very cozy lodges built in African beach safari style and offer a breath taking seaview, a comfortable bed, mosquito net and paraffin lamp and tranquility. Karibu (Welcome) as we say here in Kenya for everyone at anytime who wants to relax while enjoying the true beach life as a beach bum. All Lodges and the Campsite have a seaview. THE BEACH AFRICA is only 10 min away from the famous Jumba la Mtwana Ruins and other historical sites, we offer fishing & snorkeling trips, dolphin dives and safari , Diving & Windsurfing etc. bookings. Special Offers for Volunteers! Stay and Volunteer at the Beach Africa\'s Beach Turtle Conservation & Community Center! 1 Week/ 70 Euro incl. Bed & 2 meals! Participate in Tutlte Protection, Tree planting program\'s, Community Work. Stay, volunteer & enjoy an unforgetable experience with a good deed. check out the program at sneezeonline.com page. A very hip and young town with many shopping facilities Bars, Nightclubs and Restaurants. Along the Mombasa-Malindi Mainroad you take the road to your right at Kenol Petrol Station - straight down to the Mtwapa Beach. Follow the White and Orange Signboards written BACK PACKERS and/or BEACH BAR on it. Every Taxi in Mtwapa will take you there in 5 min. for a reasonable amount - we also offer pick up (please call us on the number on the confirmation e-mail) We advise you not to use Motor bike taxi as they are accident prone. Please note The Beach Africa is directly at the Sea! Your Accommodation has Sea view, make sure you have arrived at the right premises as you have booked.